Visit By the Board of Pobal to Flagship Community Services Programme in Truagh. Following on from the visit late last year of Ministers Heather Humphreys and Leo Varadkar to the Blackwater Valley Learning Centre, the Board of Truagh Development Association played host once again to important visitors to Truagh. 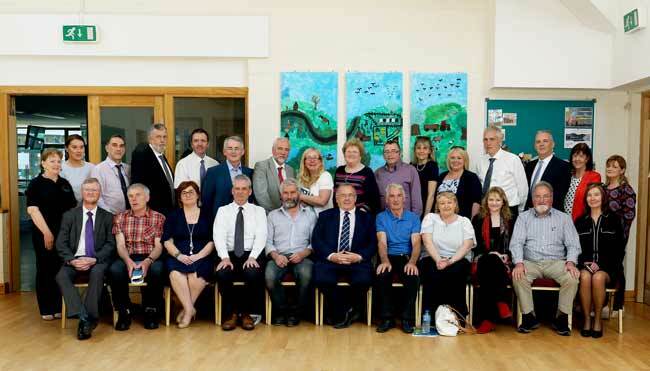 Last Thursday 25th May 2017, Chairperson of Truagh Development Association, Michael Treanor and fellow board members were delighted to welcome the Board of Pobal to the Blackwater Valley Learning Centre, Knockconan, Emyvale. Mr Treanor explained, “today’s meeting is a great opportunity to showcase the work of Truagh Development Association to our funders from Pobal. It is important for them to see how the Community Services Programme (CSP) serves the people of Truagh and the wider north Monaghan area. They were keen to hear about the range of services provided by the CSP and see for themselves how they impact on people’s lives in a very positive way”. “At the moment the Community Services Programme employs 10 staff and delivers a wide range of services to the community such as the weekly Monday Social Meal, home visits to the over 55s and meals on wheels, to name only some of the services”, Mr Treanor added. “Since the Ministers’ visit last year we have already fulfilled one of our targets. We are in the process of hiring a full-time Sales and Marketing Coordinator who will promote existing and new services. Our plans remain focused on looking to the future”, he clarified, “and we have four projects at delivery and planning stage which we are confident will improve the lives of people in Truagh both socially and economically”. Action Sliabh Beagh Conservation Management Plan. Expansion of facilities and space to include training rooms, community rooms and to work closely with stakeholders to expand the delivery of services at local level. Heritage: with the support of the National Museum of Ireland, Errigal Truagh Heritage Committee to become part of the Irish Community Archive Network. “Truagh is a parish that is growing”, the chairman explained, “today the members of the board of Pobal saw a busy community centre catering for 50 school children at the Blackwater Centre and 20 children in Clara NS. They saw that Knockconan National School and Tru Beginnings Childcare, which are located in the same building, have grown so much they have had to take over some of the rooms previously occupied by the Community Services Programme. Truagh is a parish that is starting to thrive and Truagh Development Association’s plans for the future will build on that”. Truagh Development Association’s future projects and developments demonstrate an ongoing commitment to the social, educational and economic advancement of the area. With an excellent track record in project management and delivery over the last 25 years, the future bodes well for this corner of Monaghan. Background: Truagh Development Association Ltd. (TDA) is a voluntary community organisation based in north county Monaghan that has worked to develop the community of Truagh since the mid 1970s. It became a not-for-profit Company Limited by Guarantee incorporated in 1991. Information about Pobal – Government Supporting Communities: Pobal’s mission is to work on behalf of Government and in partnership with its various stakeholders to improve outcomes, particularly for people experiencing disadvantage and social exclusion.